Warped asks you to stare directly into infinity and embrace the mysteries of Time. Join four quirky characters as they traverse a world of suspended gears, cranks, levers, and ropes that turn like the inner mechanisms of a giant clock. Together, our characters contend with the questions that have intrigued artists, scientists, and philosophers for centuries. How does time move? How do we as humans move through it? Perhaps being alive is a spiraling tumble through the Escher-like folds of each moment, which together comprise the fabric of time. Visually rich, sometimes eerie, and always existentially engaging, Warped asks: Which choices determine what reality we land in? Highlighting themes of choice, chance, science and mortality, an autobiographical tale about a young woman who gave her eggs. With live music and aerial choreography on plastics, Egg explores the physical distortion and discomfort of the effects of hormones on the body, and the complexity created through the use of science to make a family. The performers envelop you into their otherworldly environment where gravity is more a suggestion than a law. LoopsEnd features Paper Doll Militia’s most edgy and dynamic short form works to date, retaining the dark and magical quality the company is most known for. Appealing to audiences of all ages and languages, the show has it’s foundations in universal human concepts, told with enticing visuals and non-verbal unfolding narrative. With a diverse use of mediums and aerial apparatus, the stage is continuously transformed. A true journey of the human spirit, LoopsEnd shows us a mirror of our own experiences reminding us of our collective grit and strength. 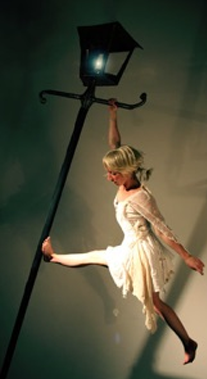 This modern fairytale for adults fuses aerial acrobatics, original music, animation, and shadow puppetry. With airborne physicality, this dark tale describes a strange encounter between a misfit little girl and an unpredictable and crass incarnation of the Devil. Join us in this magical and violent performance with high octane aerial arts on monkey bars, a streetlamp, and a chain swing. 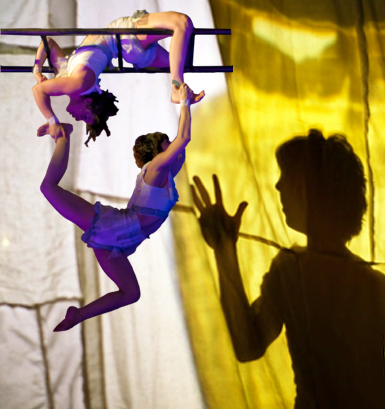 This visually stunning aerial act depicts the intense physical journey of two women on a floating ladder, suspended 15 feet in the air. Enter into our dream-like world where captivating aerial acrobatics blend seamlessly with emotional choreography that is timeless…both vintage and modern. With seemingly impossible physical feats, Their Secret Steps will delight and surprise any audience. This is a versatile act, perfect for large events, festivals, and intimate, theatrical settings as well. Book this act at your event as a 8 minute aerial spectacular, or as the 15 minute extended version that includes our unique theatrical shadow dance intro. A stunning aerial theatre short where world class aerial acrobatics merge with vivid theatricality to create a whimsical, dark and dynamic performance. Suspended on two spinning loops of steel chain, The Paper Doll Militia move with precise synchronization and impressive partner work, hanging from each others’ limbs from their inventive apparatus. Crossroads is an ensemble aerial theatre short that explores the characters’ as they are caught in a “crossroads” in their lives. 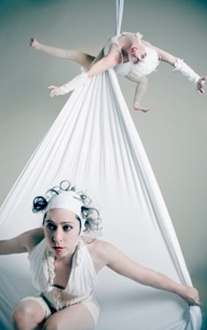 Incorporating the beauty and skill of five aerial silks artists and one stilt walker combined with innovative and theatrical storytelling, Crossroads is a balanced blend of mystery, grace, and emotional imagery. The concept for Ashes juxtaposes the seeming weightlessness of aerial and the tangible weight of the polpe [pole+rope], a rope weighted with a 25-pound sack. The polpe, a Paper Doll Militia original apparatus, provides both stability and the unpredictability of free-flying weight. This element makes precision of choreography and movement imperative and imbues an underlying feeling of chaos. Inspired by breath or lack thereof, “Seretide” is the name of an asthma medication. The Multi-Cordes attachment to the ribs is a call back to that. Original apparatus designed with 12 strings for the 12 ribs that wrap the lungs. Paper Doll Militia offers a truly unique performance using the rare specialty apparatus of Aerial Chain. Both industrial and supple, the aerialist dances with ease on the steel chains as if they were silk. This is a refined and powerful performance, mixing the grace of aerial dance with the excitement of dynamic twists and falls. The audience will be entranced by punctuated rhythm and unique theatricality of this silks performer. Witness this classic aerial art performed with stylistic flare, this is a Paper Doll specialty. he simple elegance of a single rope creates intrigue as the aerialist demonstrates mastery over her apparatus with strength and beauty. 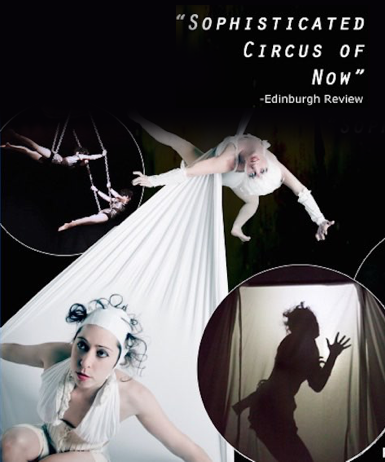 The audience will delight in losing themselves in the intricate weaving of knots around the aerialist’s body. This act is perfect for the more intimate and artistic of settings; it is subtle, difficult, and extremely rewarding to watch. Both sensual and artsy, this swinging and spinning streetlamp is a curiosity of imaginative pole dancing. This custom designed original is as quirky as our Paper Doll dreams. With a darker tone, the aerialist/pole dancer in this act is elegant, dramatic, and mysterious. Sometimes an event needs charisma, or mystery, a sense of being different, rather than an evening of performance showcasing. Paper Doll Militia can provide ambient aerials at any event, with costuming, music, mood and apparatus that compliments the theme of your evening. Paper Doll Militia produces full shows, cabaret style evenings, and provides event entertainment. For more info on additional acts for Entertainment, including variety and ground acts, please browse our Entertainment Website.